Superimposed on the spectrum of a star (or galaxy) are a series of dark lines. 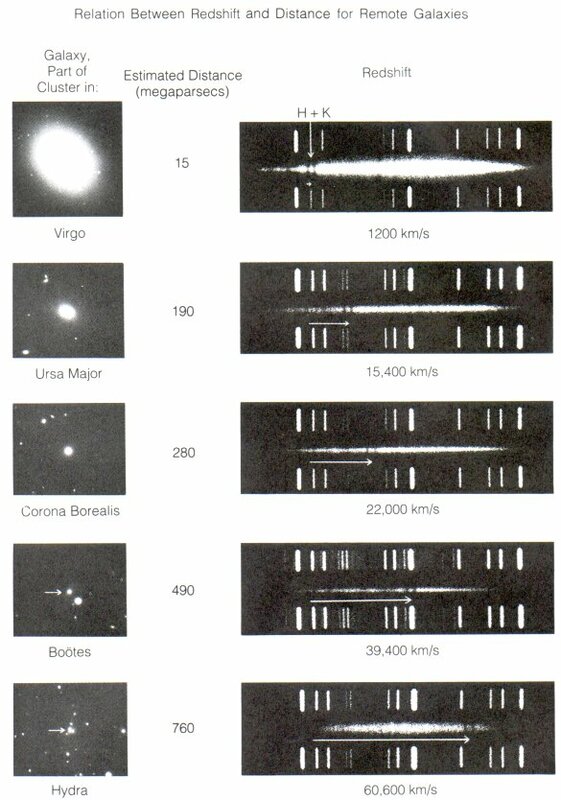 These absorption lines mark wavelengths at which gases in the star's outer atmosphere have absorbed light. Different gases absorb light of different wavelengths. In fact, one can identify particular elements in the spectrum of a star (or galaxy) by the wavelengths of light which are absorbed. We can measure the speed of stars in our own Milky Way, as they orbit around the center of the galaxy. Most of the nearby stars follow paths which are similar to the Sun's. Like cars all going the same way along the highway, they appear to move past us relatively slowly: we measure speeds of around 30 to 50 km/sec, relative to the Sun. Occasionally, we find a star with a much higher speed: up to 220 km/sec. These "speeders" are not part of the disk, but part of our galaxy's halo. They fly far above and far below the plane of the disk, and zoom through the disk at very high speeds. In the early twentieth century, the construction of big telescopes at Mount Wilson (the 60-inch and 100-inch) allowed astronomers to determine the motions of galaxies for the first time. During the past year two spectrograms of N. G. C. 7619 were obtained with Cassegrain spectrograph VI attached to the 100-inch telescope. This spectrograph has a 24-inch collimating lens, two prisms, and a 3-inch camera, and gives a dispersion of 183 Angstroms per millimeter at 4500. The exposure times for the spectrograms were 33[h] and 45[h], respectively. At six hours per night, each exposure took at least five nights! Edwin Hubble studied galaxies, using the biggest telescopes in the world (then at Mount Wilson). He photographed nearby galaxies and tried to find ways to determine their distances. In the nineteen-twenties, his best method (and it wasn't a great one) was based on the brightest stars in a galaxy. He assumed that the brightest stars were all of the same absolute luminosity, or standard candles; by comparing the apparent brightness of the brightest stars in different galaxies, he could calculate the distances. It turns out that Hubble made several errors in his distance measurements; one of the most serious was mistaking compact clouds of glowing gas -- HII regions -- in some galaxies for the brightest stars in them. Although his relative distances weren't bad, his absolute distances were all much too small. More recent measurements, using the Surface Brightness Fluctuation technique, show a similar correlation, but yield a much smaller value of H0. This tells us that the galaxies are moving away from us at very large speeds. Unfortunately, at these very large distances, we can't measure distances accurately. But if we are willing to accept a few extra assumptions, we can look much farther into the universe to see if the radial velocity of objects continues to increase linearly with their (assumed) distance. "Hey, Jane, how distant is the Coma Cluster?" "About 7,000 kilometers per second." "Rats, that's too far for us to use the TRGB technique ..."
But there's another quantity, related to radial velocity, which astronomers use even more frequently: redshift. We use it because it is what we actually measure from spectra: the factor by which absorption or emission lines are shifted from their rest values. For very distant objects, moving at very high speeds away from us, we sometimes see redshifts greater than one. How is this possible? Is the galaxy moving faster than the speed of light? A scientific biography of Edwin Hubble written by Allan Sandage, his successor at Mount Palomar. Hubble's first announcement of the distance/radial velocity relationship, a paper published by the National Academy of Sciences in 1929. An experiment in which you (yes, you) can measure the Hubble constant using galaxies in the Hubble Deep Field. This is way cool, but does require Java and may be a bit slow, since it's hosted in England. Thanks to Ian Smail, at the University of Dunham. The LCRS galaxy redshift survey has a nice picture showing how astronomers now use the redshift of a galaxy as a stand-in for its distance.